Communication is the key to everything in business. Without proper communication you can lose customers and even worse, lose loyal employees who feel unheard or unrecognized. Internal communication has long been an issue within companies of all sizes. Old-fashioned bulletin boards are quickly forgotten, and it’s hard to know what’s new and what’s old without a management system in place for that bulletin board. The same problems arise with other traditional communication means. Communication channel feasibility is key. In order to reach the right people, you need to think about which channel to use. Internal communication needs to be as clear as possible for your employees. E.g. in factories or wareshouses people might not have instant access to emails or intranets. Digital signage is 21st-century-thinking at its finest when it comes to bettering your business. 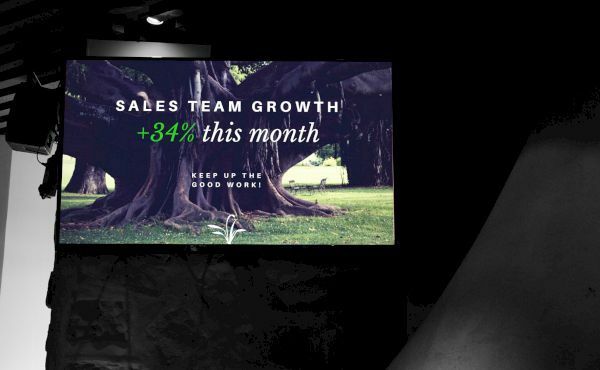 Using digital signage within a company to increase and improve internal communication will aid the overall business in many ways. After all, having an updated and widely viewable communication channel is a critical part of keeping everyone alert, in-the-know, and on the same page. Employees can easily find work schedules, targets or current events, rather than asking around and wasting time on information gathering. The communication doesn’t interrupt work, and the content is always relevant and up to date. The benefits of good internal communication are plentiful. First and foremost, with a digital sign that can display updates and any relevant notification to your employees, everyone will know where to look when they need new information. There will be no tracking down an office memo or remembering to check the bulletin board hoping that it’s been updated. Digital signs can be placed in multiple locations to ensure every employee has an accessable and memorable spot where they can go to look for updates or be alerted of notifications. The content on digital screens is managed centrally and remotely, for example from the headquarters to all locations nationwide. You can schedule the content beforehand, or update it on the fly using ready-made branded templates. Real time displays are crucial, especially in urgent matters such as fires or accidents. With digital signage you can communicate urgent news rapidly and effectively to the whole company. You can prioritize e.g. crisis information higher than regular content, to ensure that the message always gets through. As with anything in business, you have to ask what return you can expect on such an investment. Some of the top changes you’ll see when you begin implementing digital signage is that communication is flowing much easier. Employees are up-to-date on changes, there are fewer delays thanks to a smooth communication method, and anyone with a question or concern can bring it to higher staff immediately. The digital signage can be used to display a multitude of information that employees need to know right away. In the best examples of digital signage, the solutions increases commitment, motivation and results among employess. Digital signs are superbly more effective than traditional communication means because you will be able to manage and update the information displayed with ease and without wasting time placing messages on different forums. Everyone can trust that the information displayed is, in fact, present and—more importantly—digital signs can be placed in multiple locations where they are needed most.